Get Up to $1,765 in Rebates PLUS No Payments for 6 MONTHS*! 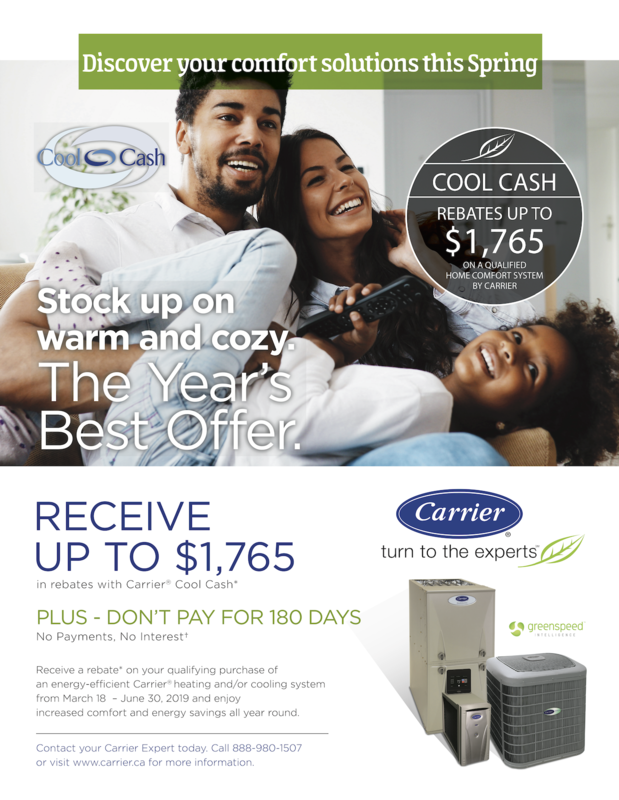 DON’T WAIT TILL SUMMER TO PURCHASE YOUR NEW HEAT PUMP OR A/C SYSTEM – STAY COMFORTABLE THIS SUMMER WITH CARRIER’S COOL CASH. 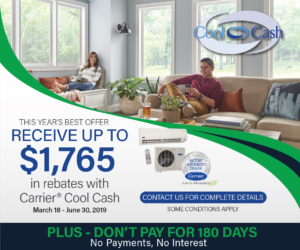 If you are in the market for a new Heat Pump or Air Conditioning system in Halifax, Carrier has a promotion designed to help make the purchase a little easier – Cool Cash. 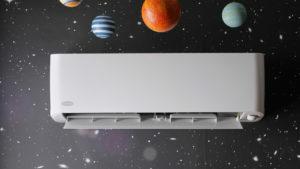 The promotion offers homeowners a rebate for purchasing a qualifying Carrier Heating/Cooling system. That means if you are looking to upgrade your Heat Pump or A/C system this spring, you could be eligible to get some money back. In order to qualify, you must purchase an approved system between March 18 and June 30, 2019. Contact us to learn more! The rebate amount depends on the system’s SEER rating—SEER is how the Air Conditioning, Heating, and Refrigeration Institute (AHRI) rates the energy efficiency of the system. A product with a higher SEER rating is more energy-efficient and will get you a higher rebate. Whether you’re looking for a new air conditioning or heating system replacement, you can trust that the skilled specialists at Atmosphere Climate Control Specialists will perform the job right the first time, every time. Our goal is to offer you the best heating and cooling systems at the best prices, which is why we are a Carrier Factory Authorized Dealer. 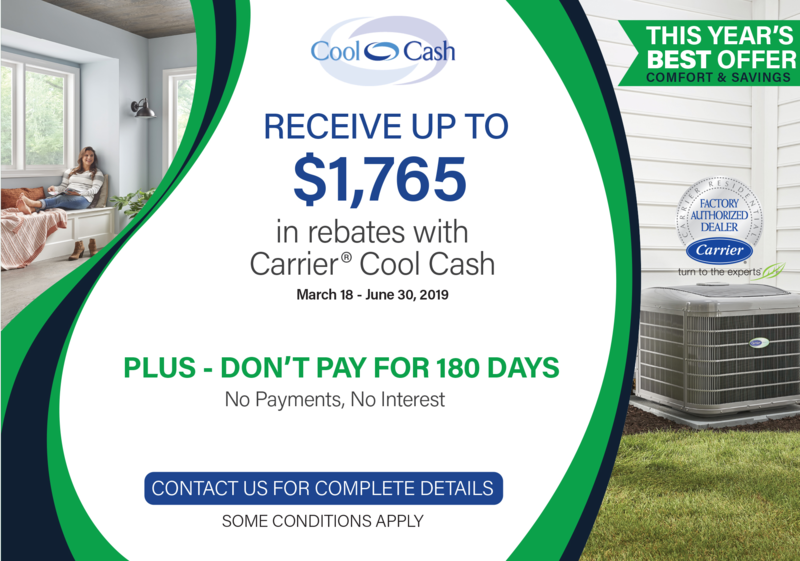 Take part in Carrier’s Cool Cash Rebate this springfor huge cost savings! Contact our heating and cooling specialists today to learn how Atmosphere Climate Control can bring cooling comfort to your home this summer!… Call (902) 483-6592 and speak to one of our sales team about how you could be saving BIG and staying cool this summer.